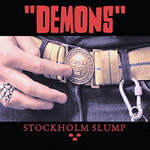 The smokin’ hot “Demons” from Stockholm Sweden use quotations to distinguish themselves from other bands with similar names. 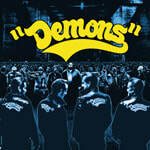 “Demons” were the first band to sign to the fledgling Gearhead Records label in 2000. 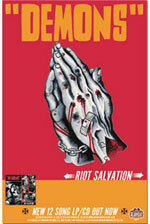 Their debut EP Come… Bursting Out garnered critical acclaim, and 6 months later, they released their first full-length Riot Salvation. Pulling musical influences from such diverse sources as The Stooges, Radio Birdman, The Dictators, and The Misfits, coupled with their greaser looks and tough attitude, the band gained a dedicated following in the US after touring with The Fleshtones and New Bomb Turks. They were a bit ahead of their time, pre-dating the whole Swedish Invasion craze of 2002/2003 by a few years, although they played in Sweden with fellow countrymen and label mates The Hives and The Hellacopters. 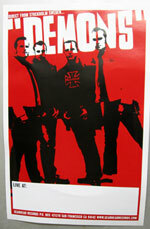 They recorded their second album Stockholm Slump in 2002 and toured the US a second time. 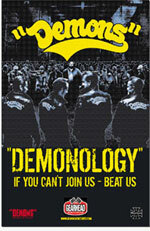 In 2004 Gearhead Records and "Demons” parted ways after their 4th release Demonology. After a short hiatus, coupled with a line-up change, the band emerged as a leaner, tighter 3 piece. They self-released their new record Ace in the Hole and are currently touring Europe extensively.